Wilhelm Wendt is killed in an accident at one of the plants in October 1924. His son Otto – the eldest of Wilhelm and Minna’s 12 children – takes over the company, resolves the conflicts and begins improving working conditions. The period between the World Wars is a financial balancing act – but full of activity, experiments and product development. Otto’s brother Guy runs the plastic plants and Harold is in charge of the chemical plants. By the start of World War II, Skånska Ättikfabriken has built the world’s most modern charcoal-burning plant, with daily production averaging 30 tons of fuel for producer-gas (a gasoline substitute) vehicles over the next five years – a major contribution to profitability during the War years. 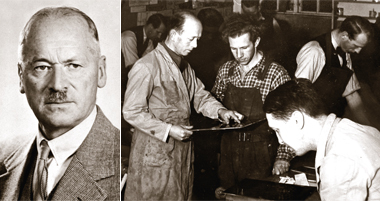 Plastic production is developed further, and by the end of the War in 1945, Perstorp is Scandinavia’s biggest plastics industry, with over 10 000 different plastic items in the range – from thimbles and billiard balls to miner’s helmets, toilet seats and telephone cases. The company´s logotype in the beginning of the 20´s century. A page of the company´s certification book for employees. Lots of new plastic items in the range.